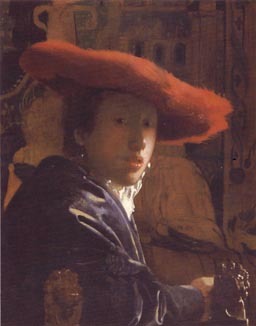 The Girl in the Red Hat is by Vermeer and is a mere 23 x 18 cm. My copy is actually slightly larger than the original, at 7 -1/2 x 9-1/2 inches. This work is still in progress. You will note there is quite a color difference, which come from the fact the prints from books often are incorrect in color. 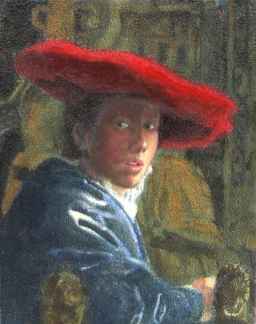 I have been informed by Frank Covino about the correct color, and am working towards that end. However, you can see I still have a ways to go to be complete. 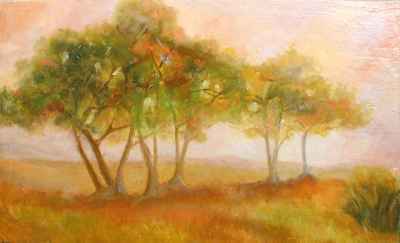 This particular work, was orginally inspired was inspired by the California Impressionists. However, it sort of went in its own direction. This particular work, was inspired by William Adolphe Beauguereau's work, "The Bohemian". She looked so much like my niece, that I decided to do a similar work. 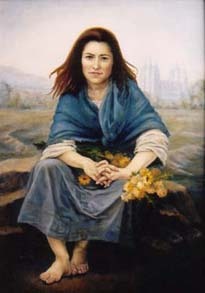 I have borrowed the pose, but beyond that, the location, colors, as well as the flowers in her lap are all part of a new image suggesting her Pioneer heritage. Instead of Notre Dame, the Salt Lake City LDS temple resides in the background.